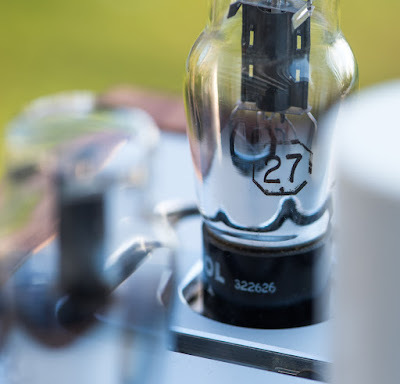 When I introduced the 27 as tube of the month in June last year, I mentioned that it could make a nice line preamp tube. In the meantime the 27 line stage is finished. 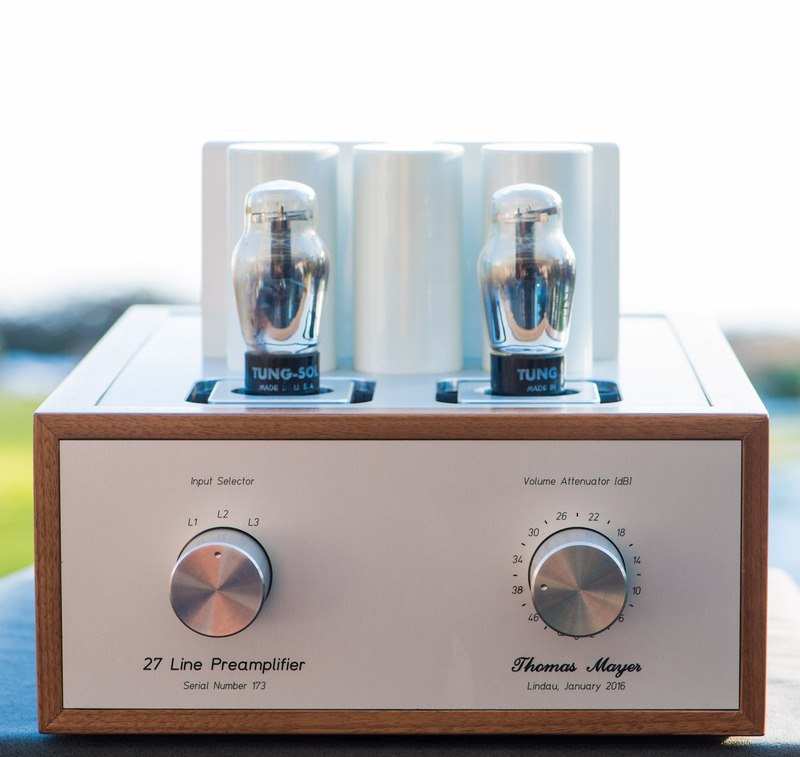 I already experimented with the 27 many years ago and used it in a preamp and as driver for a 45. 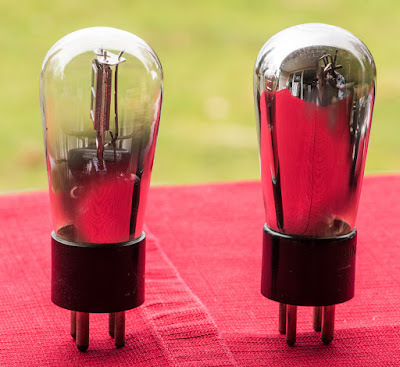 In both cases it worked very well. So it was time to put it to good use again. 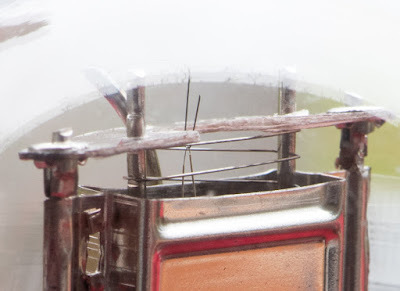 This is the latest addition to my offering of line stages. 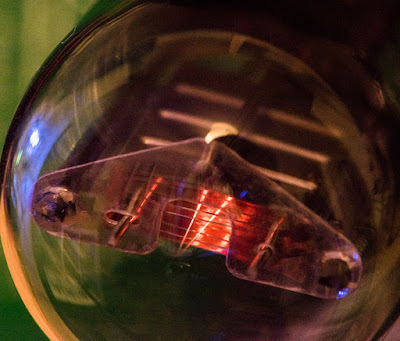 Being indirectly heated the 27 requires no fancy filament supply. 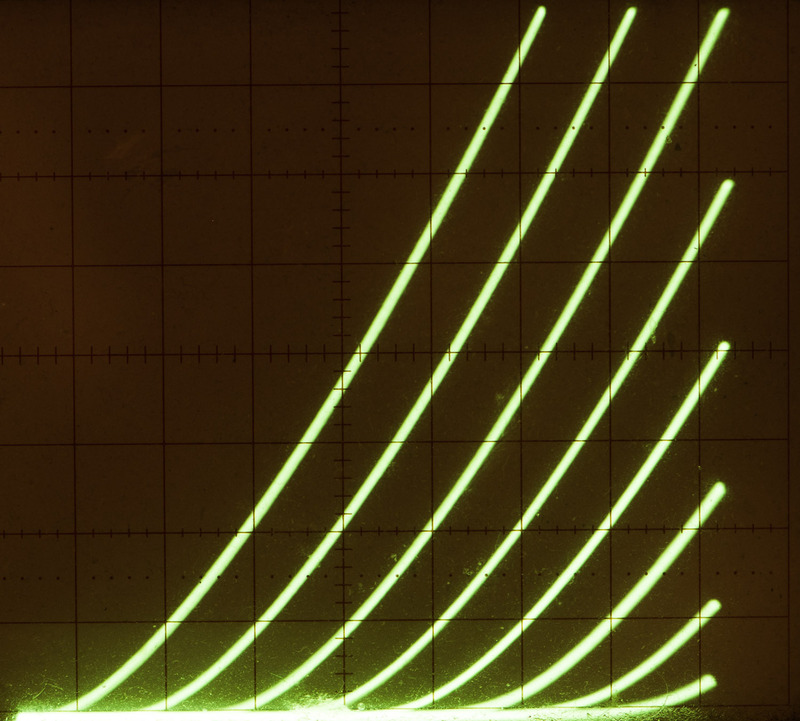 AC heating is good for hum free operation at line levels. Many people have space constraints and have difficulties to place the two chassis of a 10Y line stage. 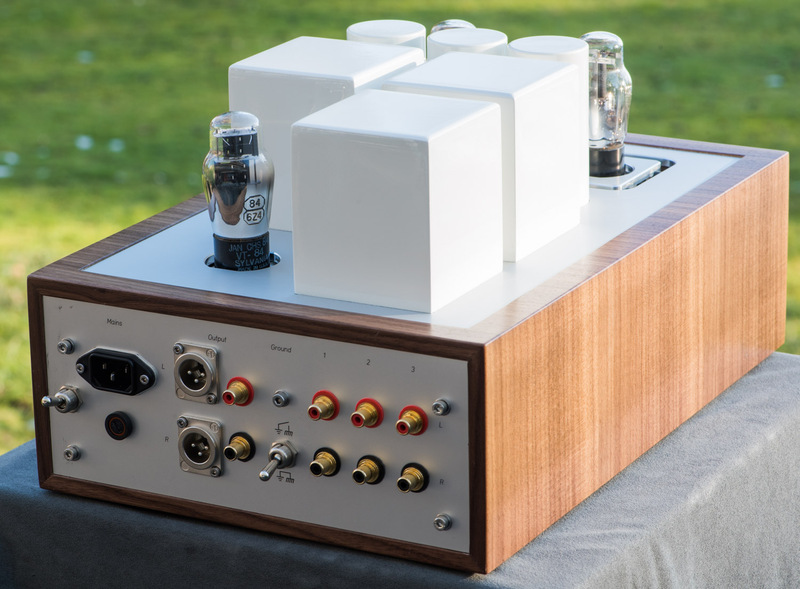 So I squeezed everything into a single chassis, including the power supply. 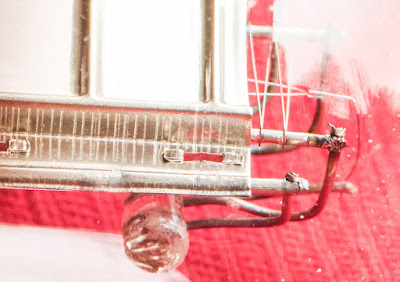 Of course the proper rectifier to use with it is the 84. Quite tightly packed. Two separate power transformers, one for the high voltage and a heater transformer for the 27s. 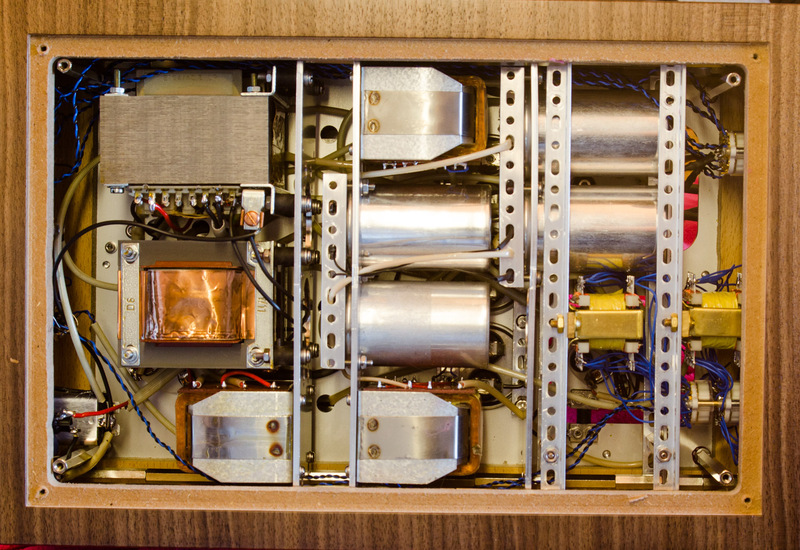 Another choke, 4 more capacitors, the line out transformers and two autoformer volume controls. The on/off switch had to move to the back. 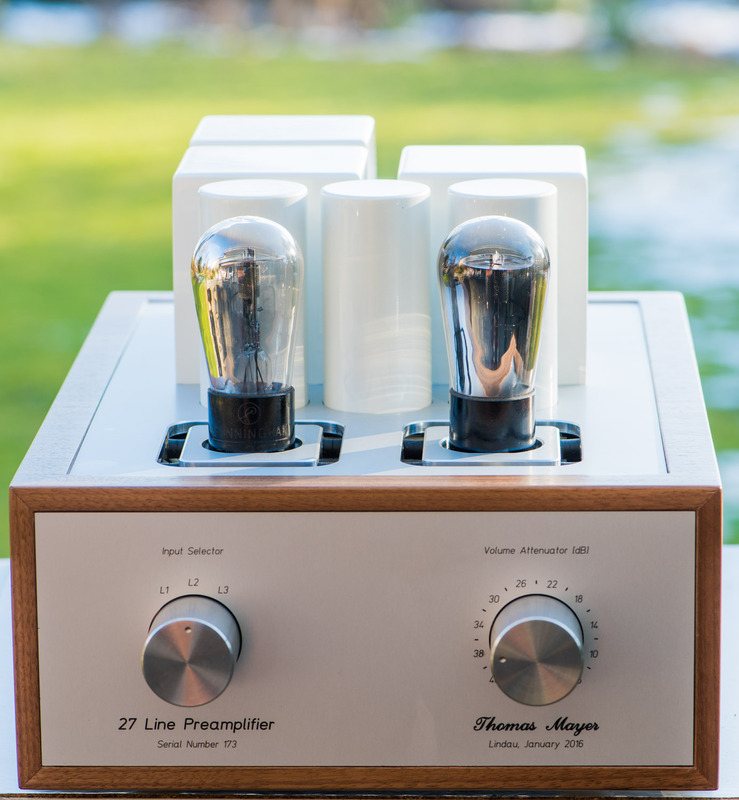 I didn't want to disturb the look of the front with the two knobs. Of course it would be possible to have it on the front as well. 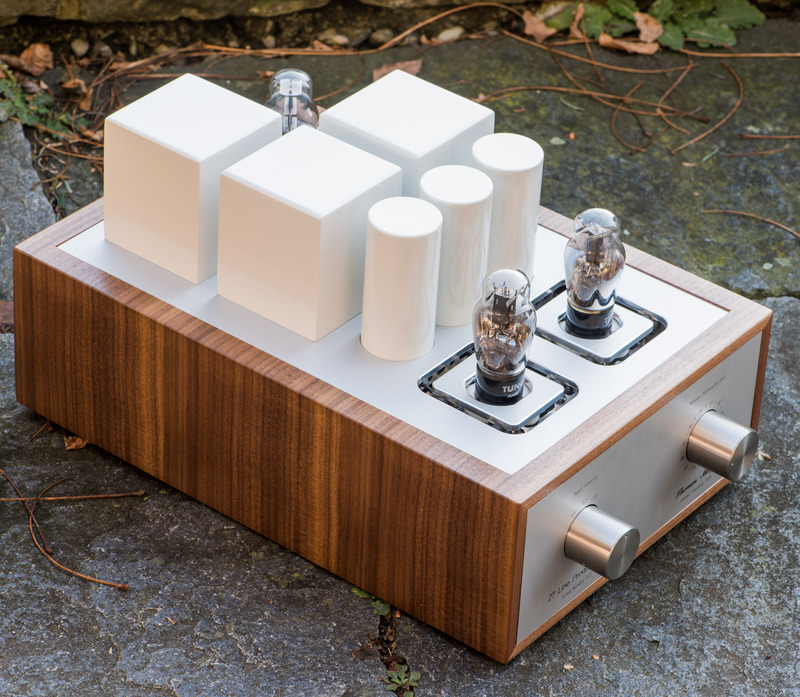 This time I picked white for the covers and capacitors. A nice preamp. 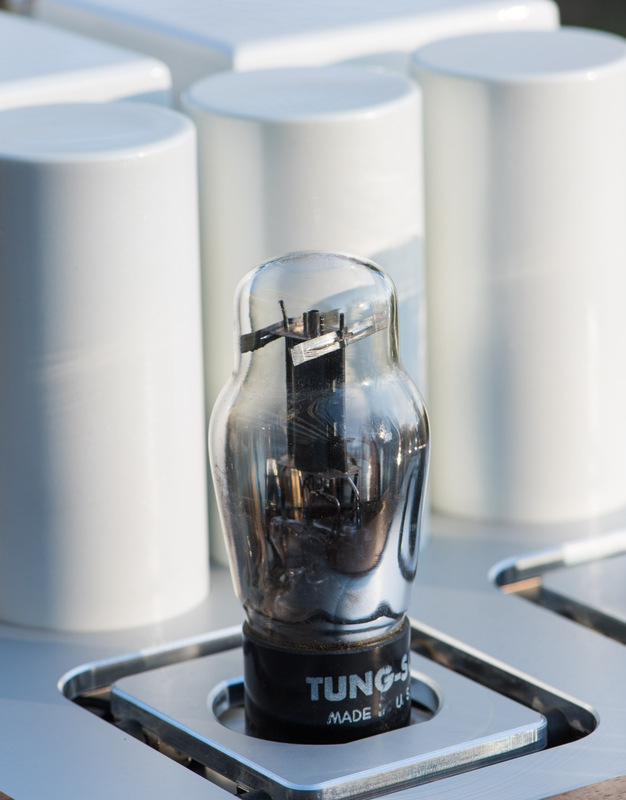 It has all the advantages of transformer coupling and transformer volume control. A bit less refined as the 10Y line stage, or any of the other DHT line stages. 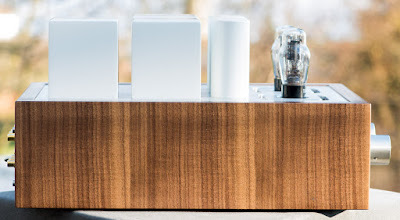 But therefor it needs half the space and comes at about half the cost. 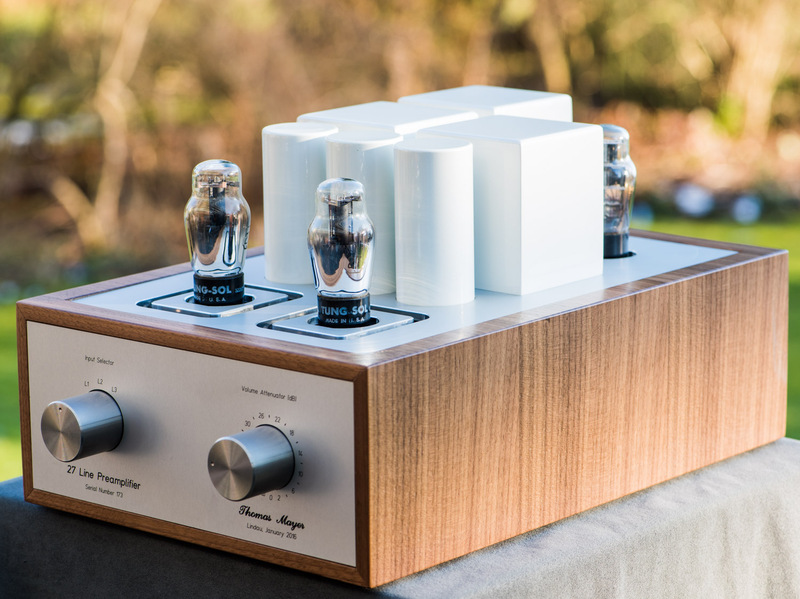 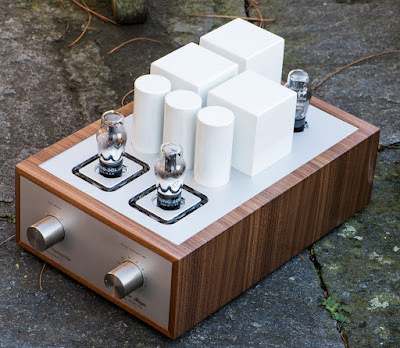 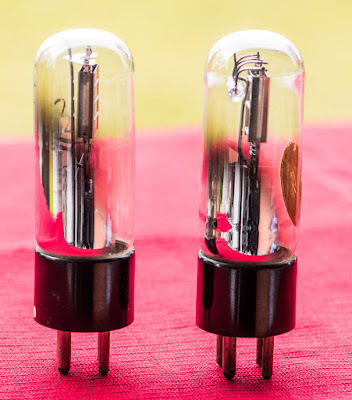 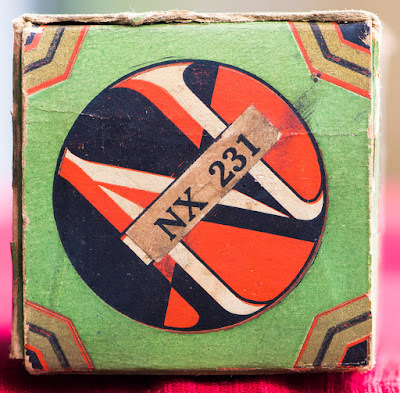 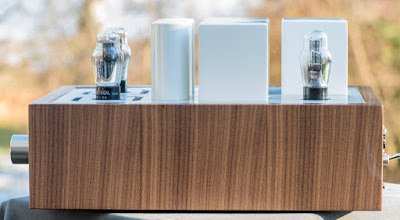 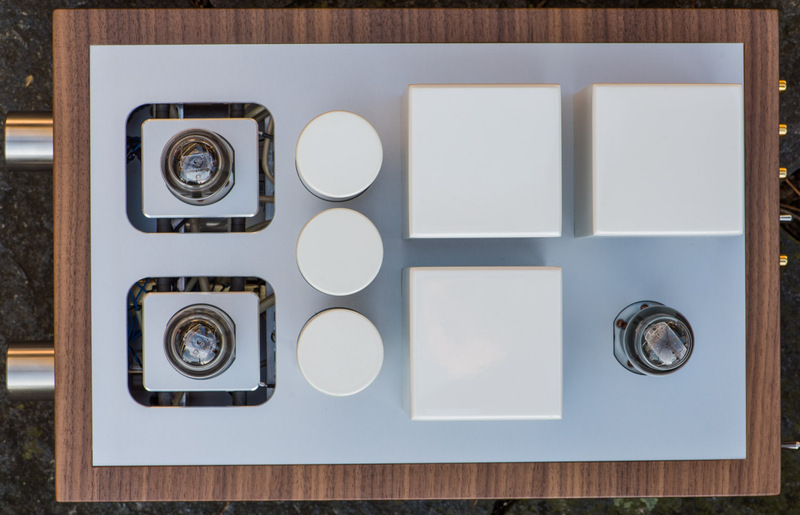 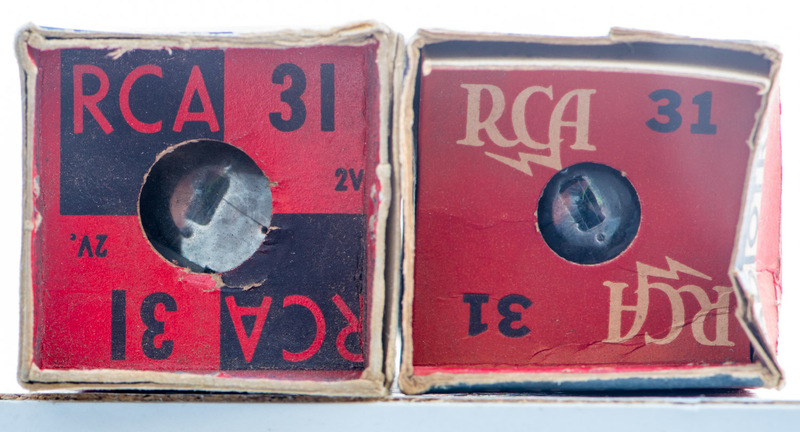 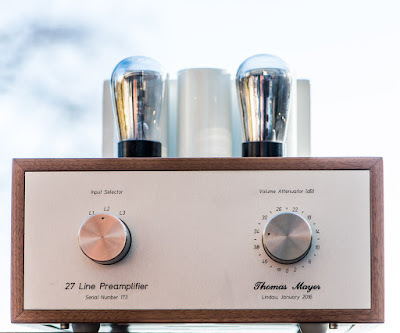 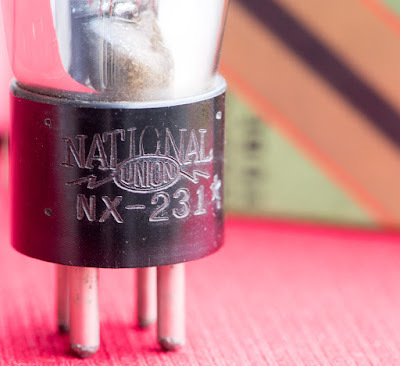 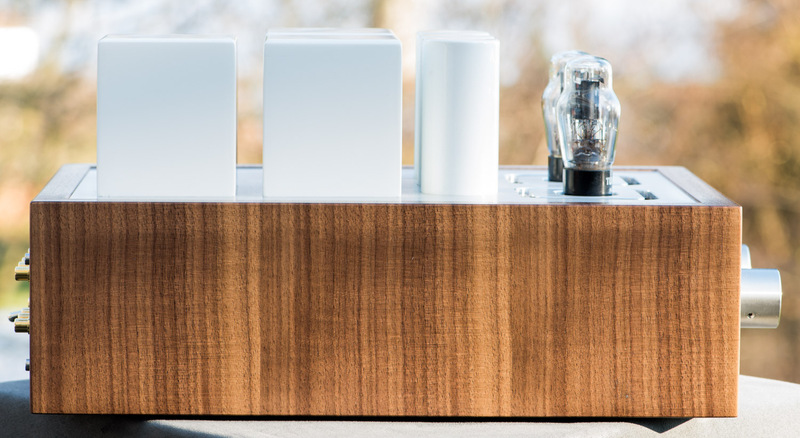 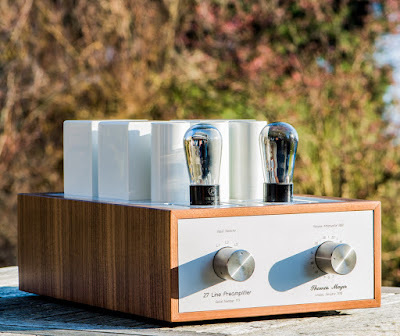 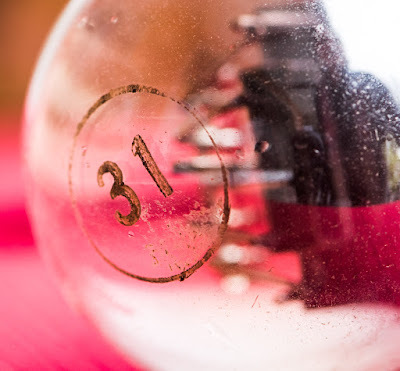 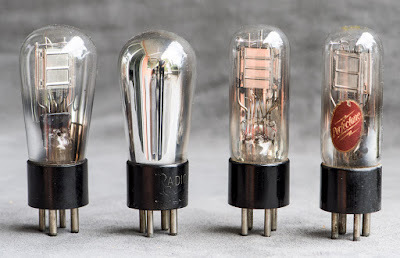 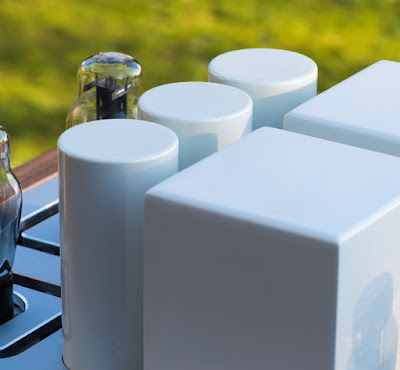 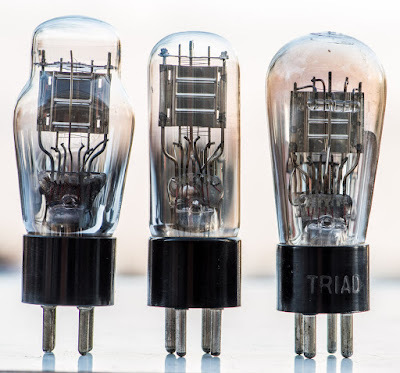 After the presentation of the two 'twin preamplifiers' in recent posts, the choice for the tube of this month is probably no surprise : The 31. 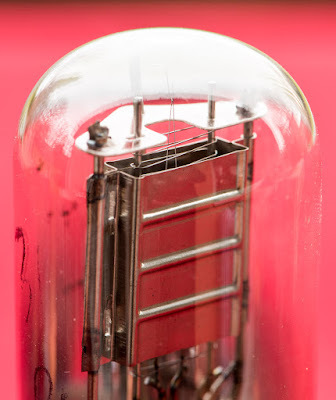 This is a small directly heated power amplifier triode developed for the use in battery operated receivers. 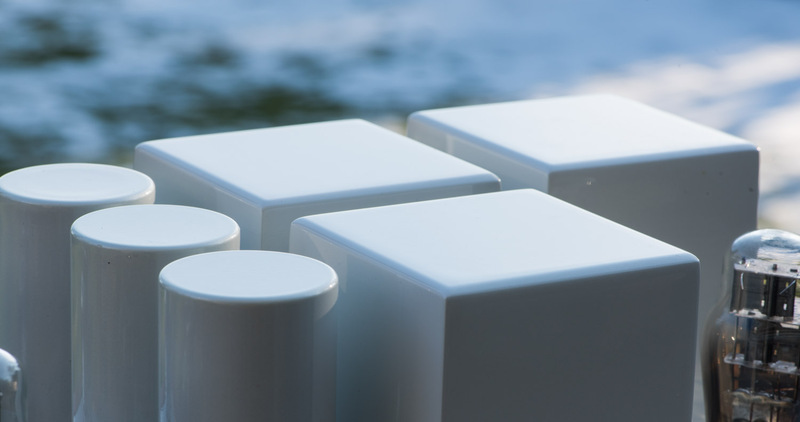 Such tubes are also often referred to as battery tubes. 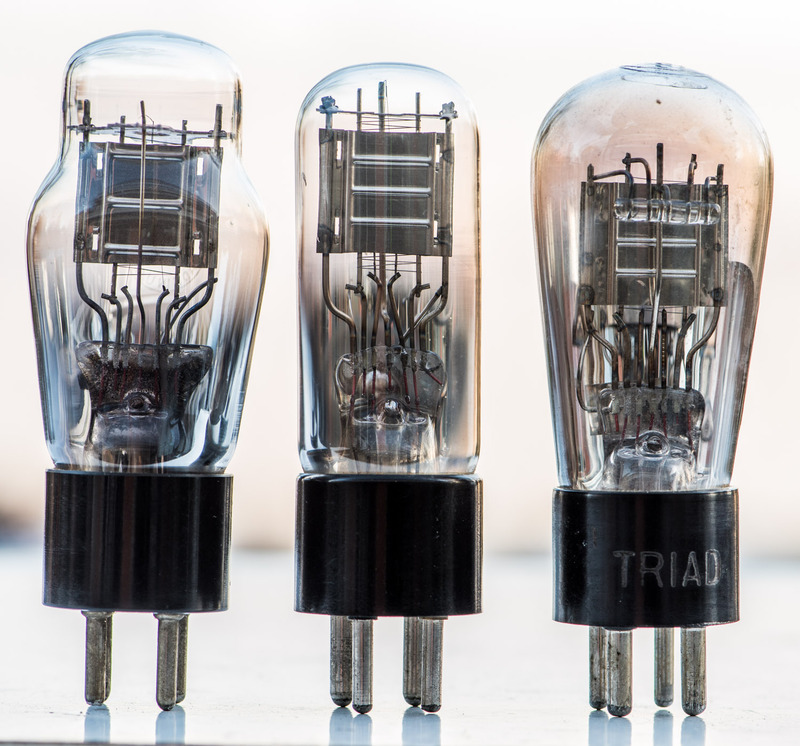 The 31 shares the same pinout as most directly heated triodes which use the UX4 base. 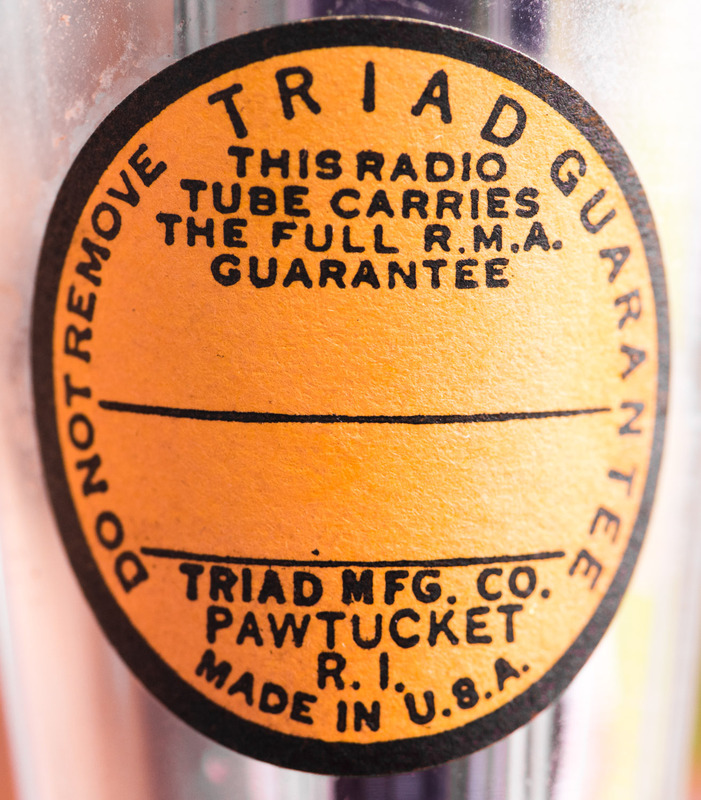 But it comes in a much smaller bottle. The coke bottle shaped version has the ST-12 size. This is the same size as the 27 for example. 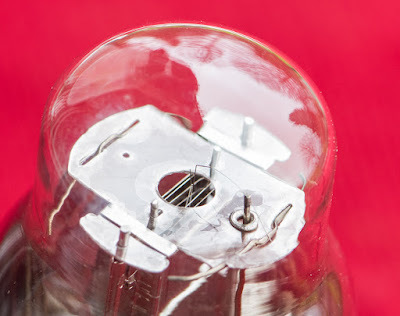 Being designed for battery operation means rather lowish plate voltage and more important very low filament power. 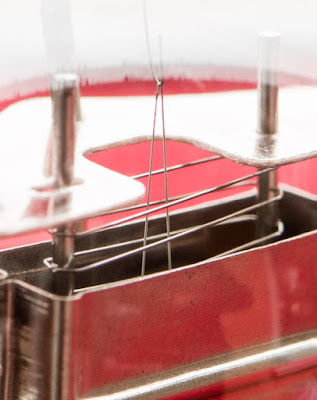 This required the development of very efficient filaments. 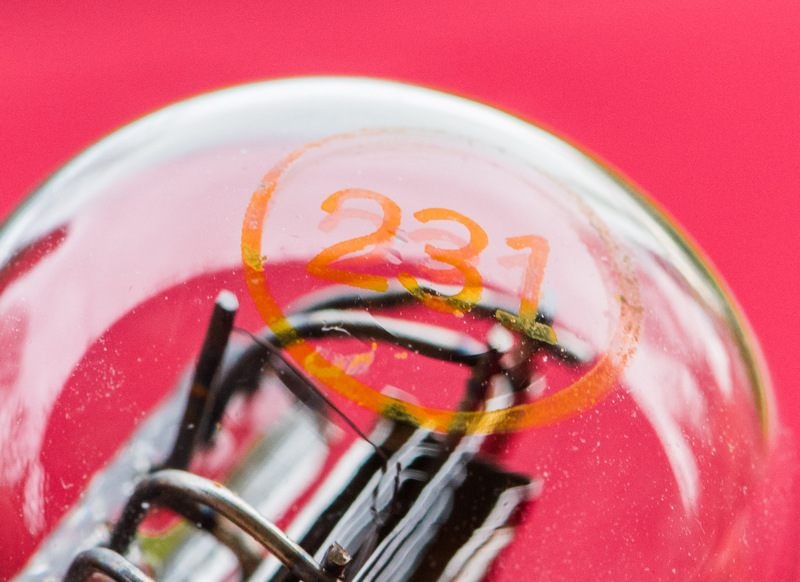 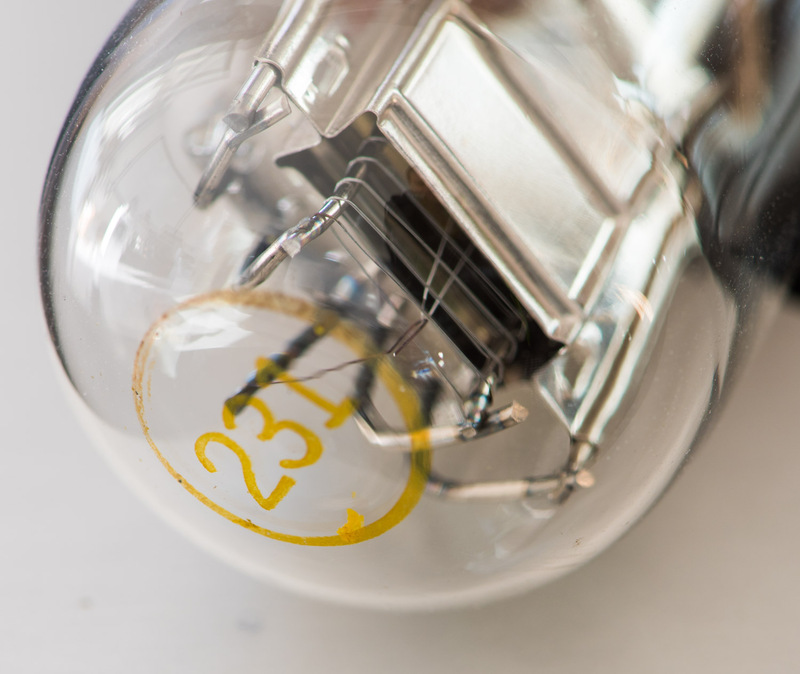 In the 31 the filament operates at 2V and only consumes a tiny 130mA. This translates to just 260mW filament power. Compare this to other types which need more than an Ampere and run on higher voltage. The typical plate voltage for this triode is 135V and the maximum is at 180V. 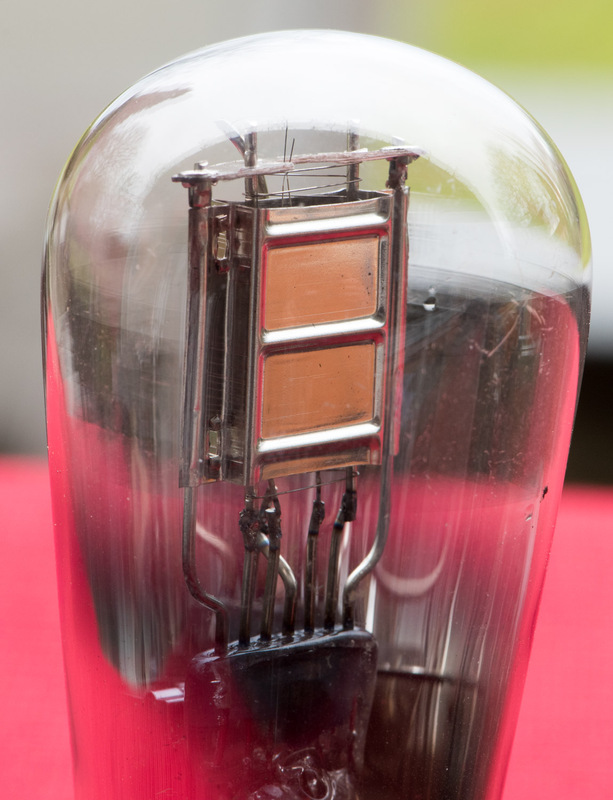 In typical operation it only draws 8 to 10mA. 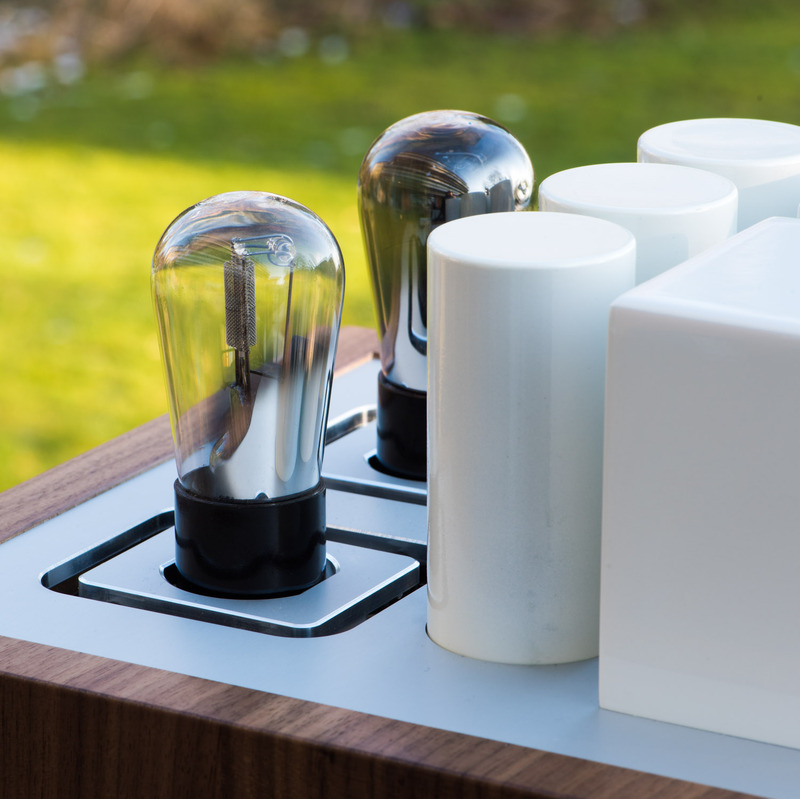 Of course not much power output can be expected when only so little is put in. 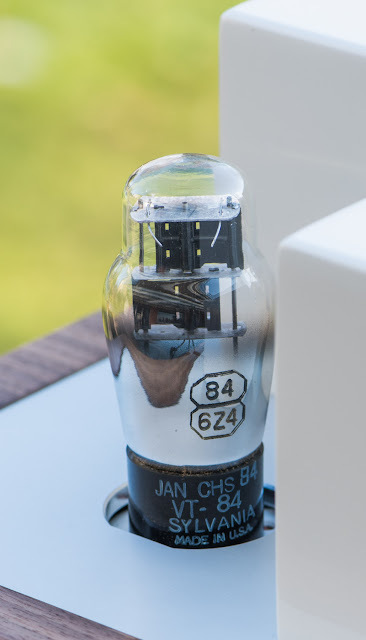 Still it can produce a whopping 375 milliwatts. 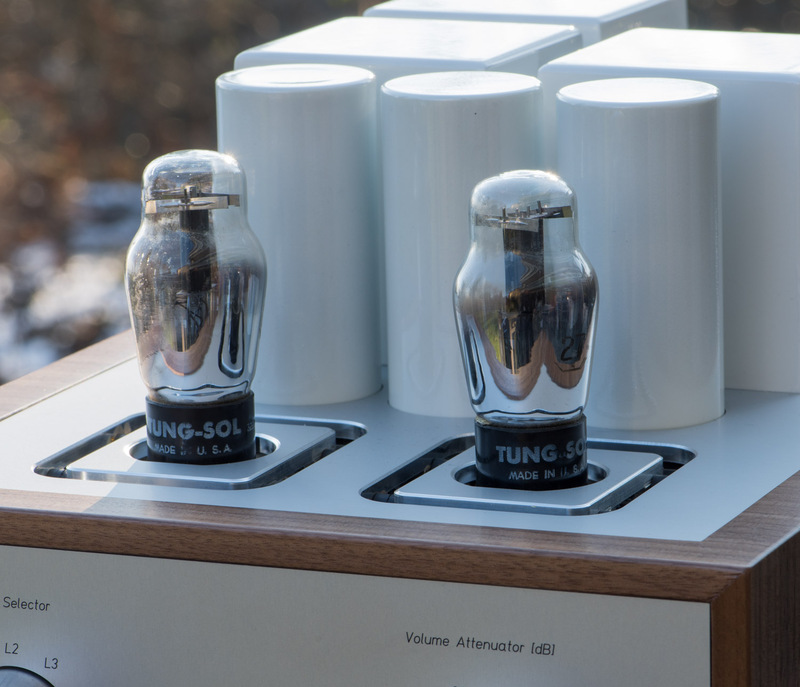 Now that would be something to power hyper efficient horn speakers. 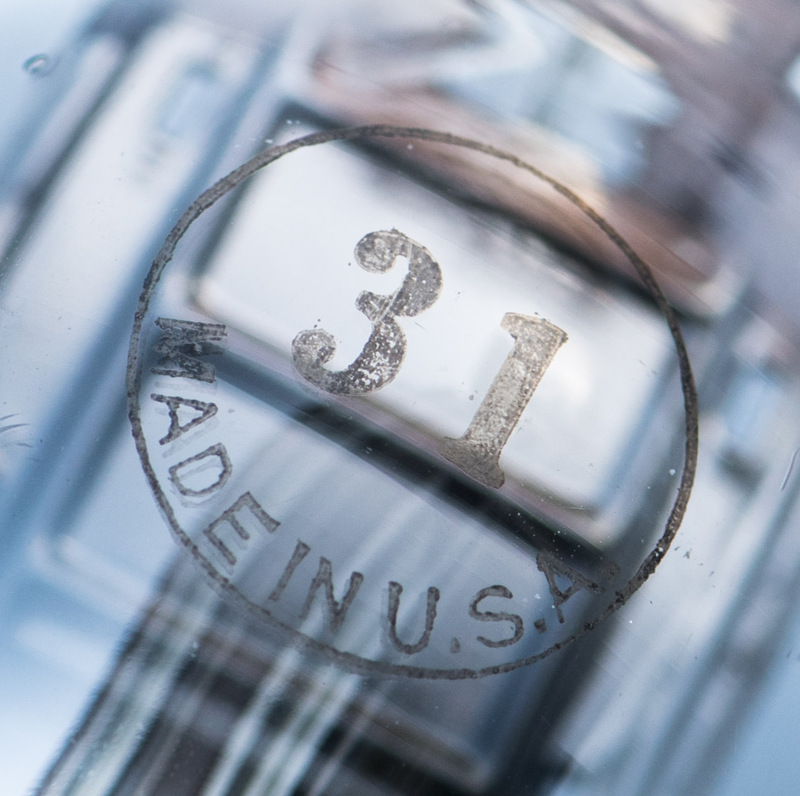 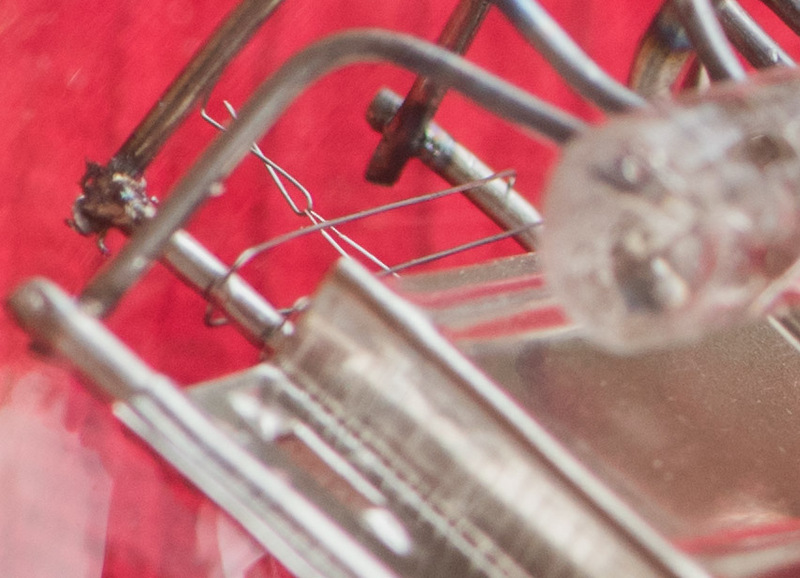 As can be seen in the first photo, the 31 was made in 3 different glass shapes. 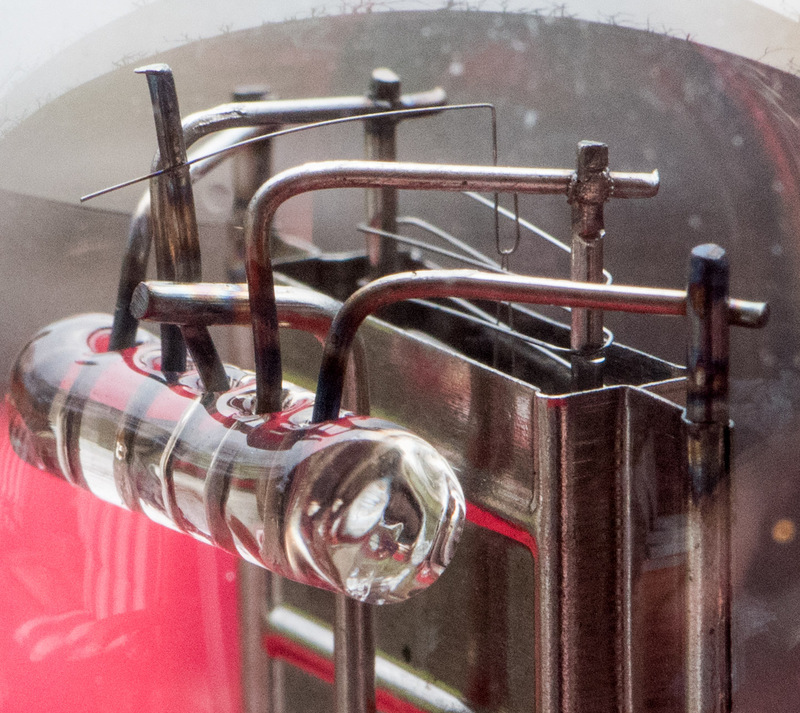 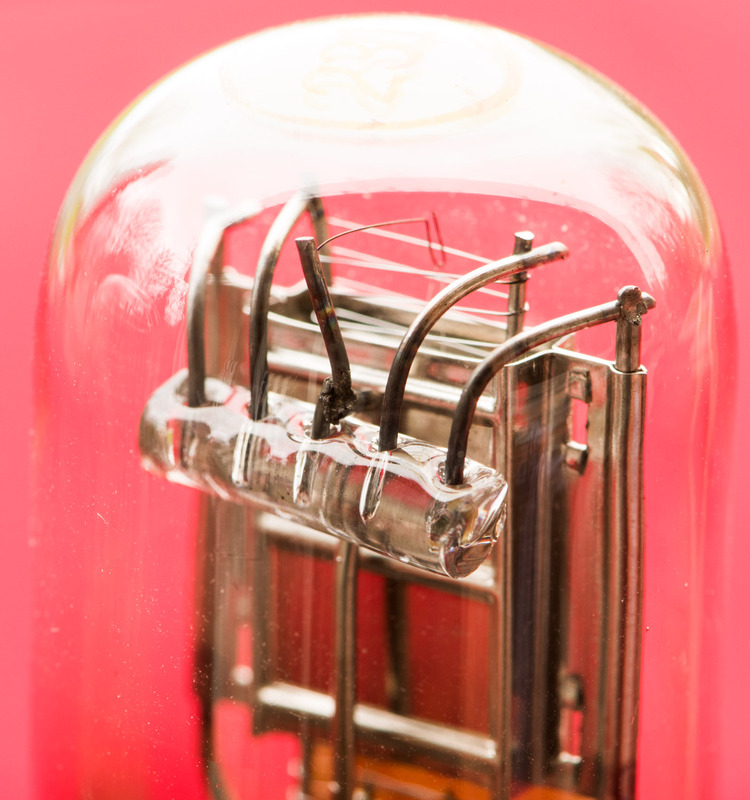 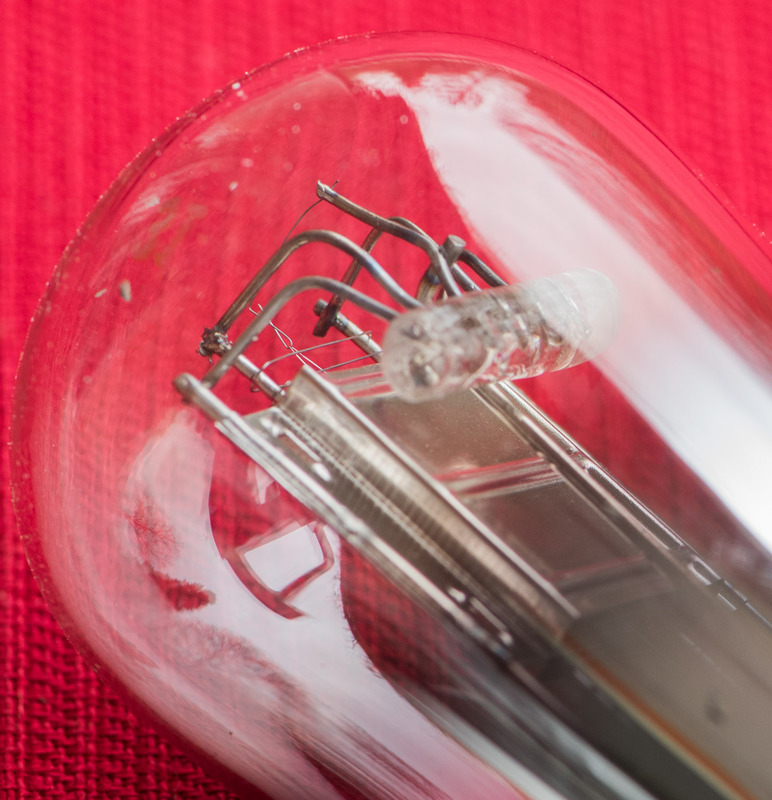 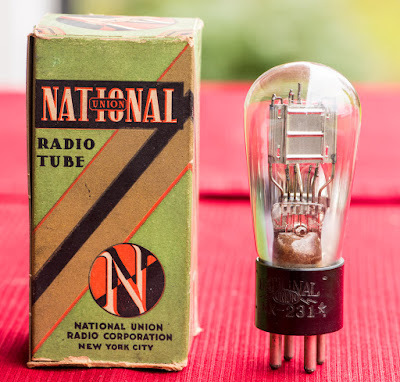 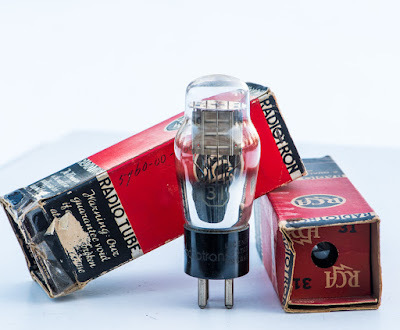 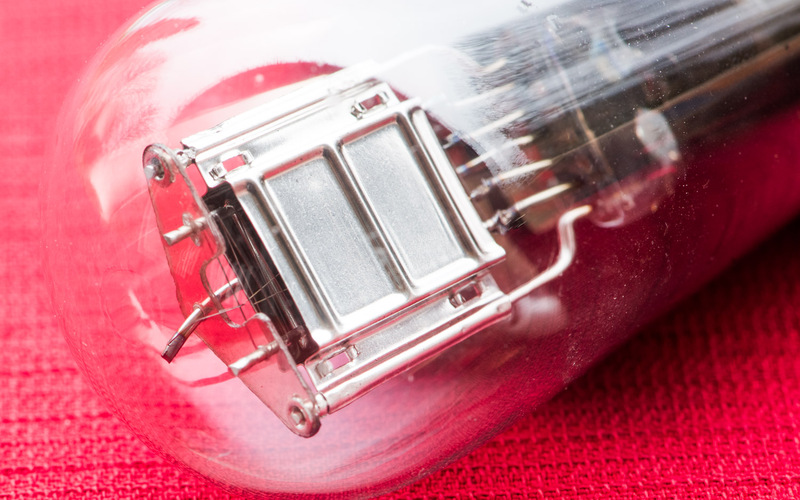 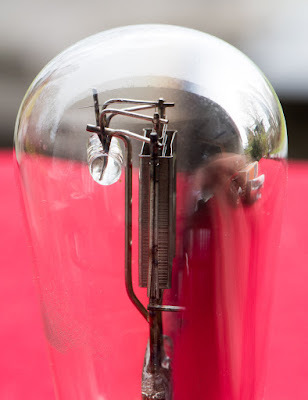 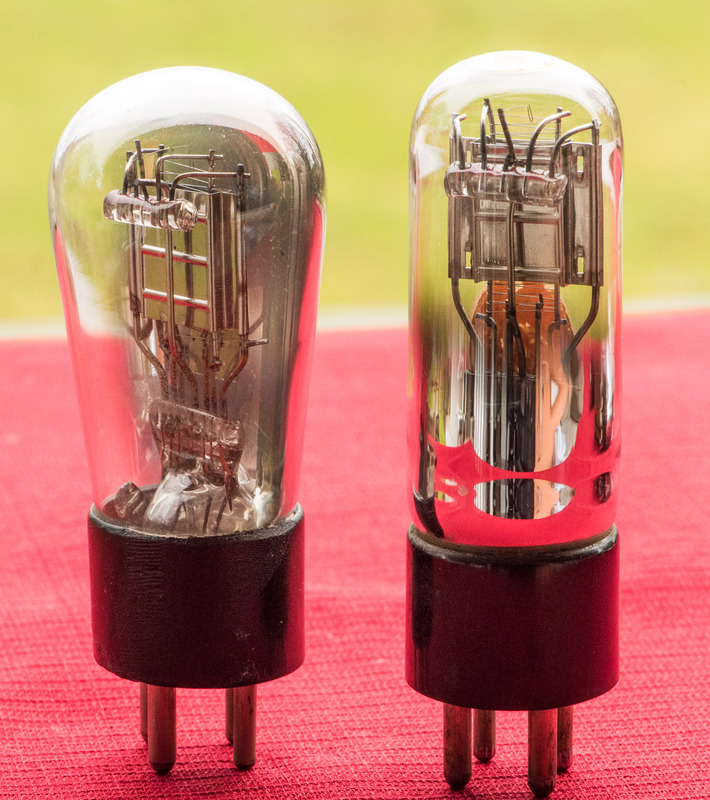 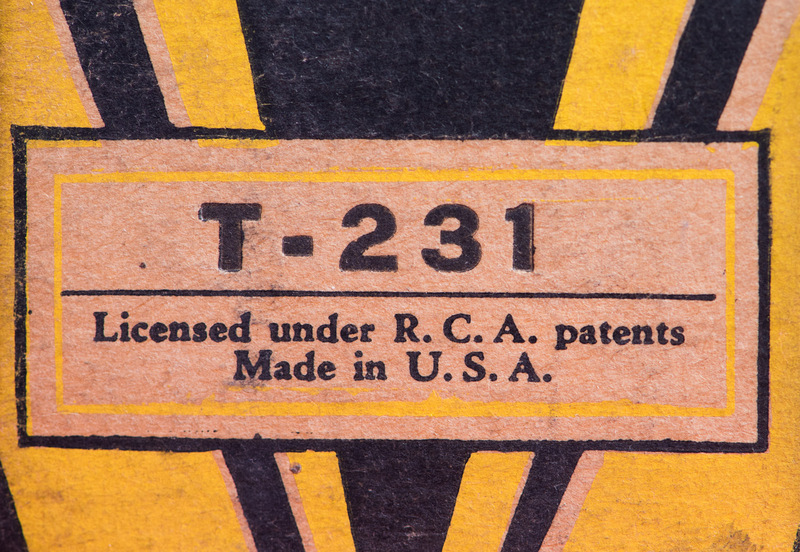 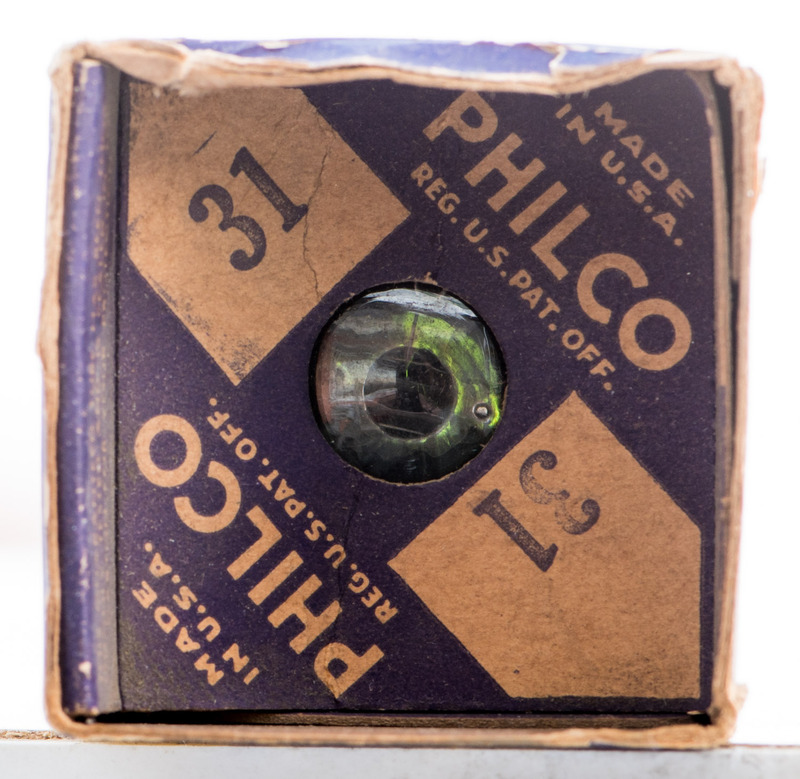 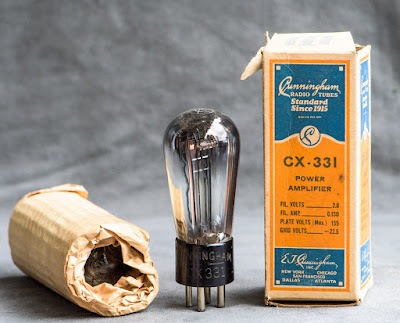 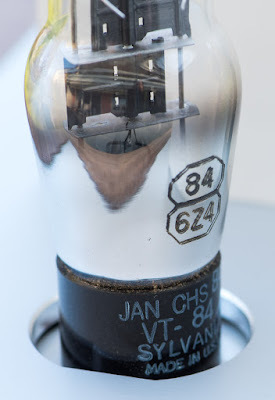 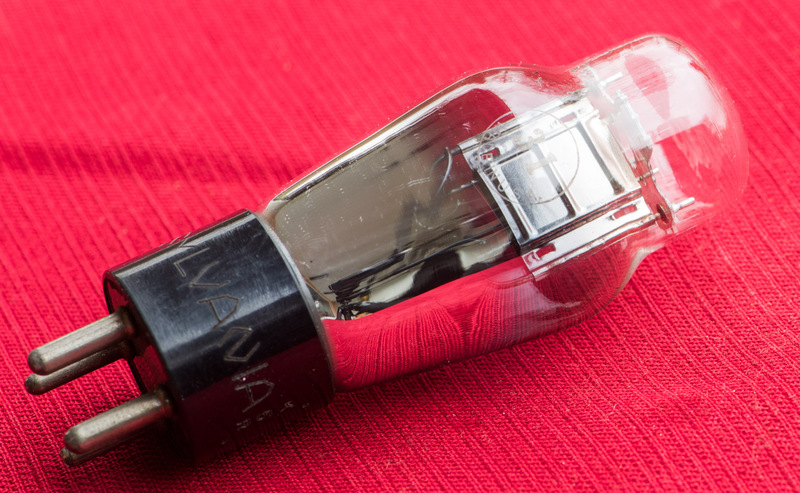 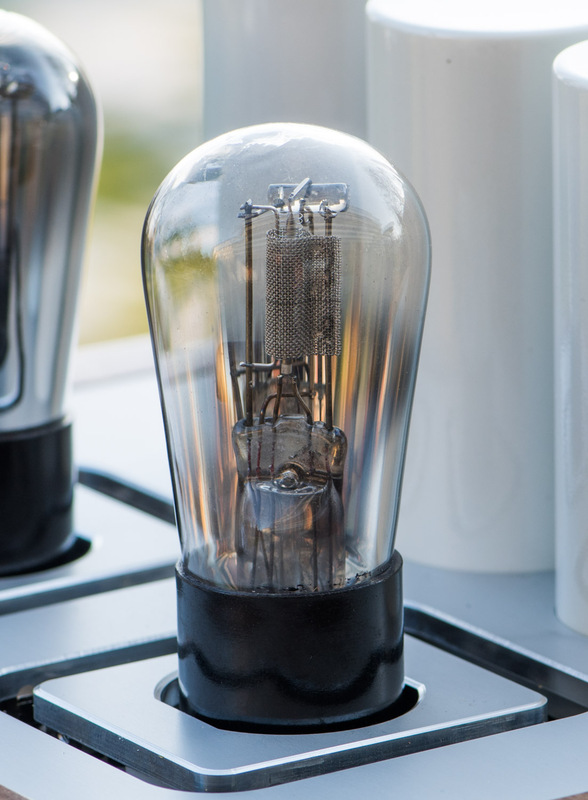 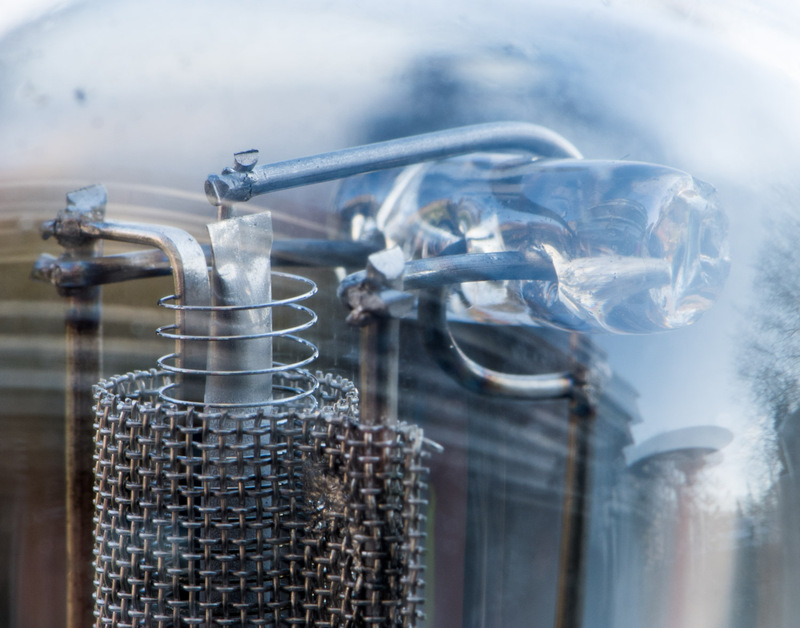 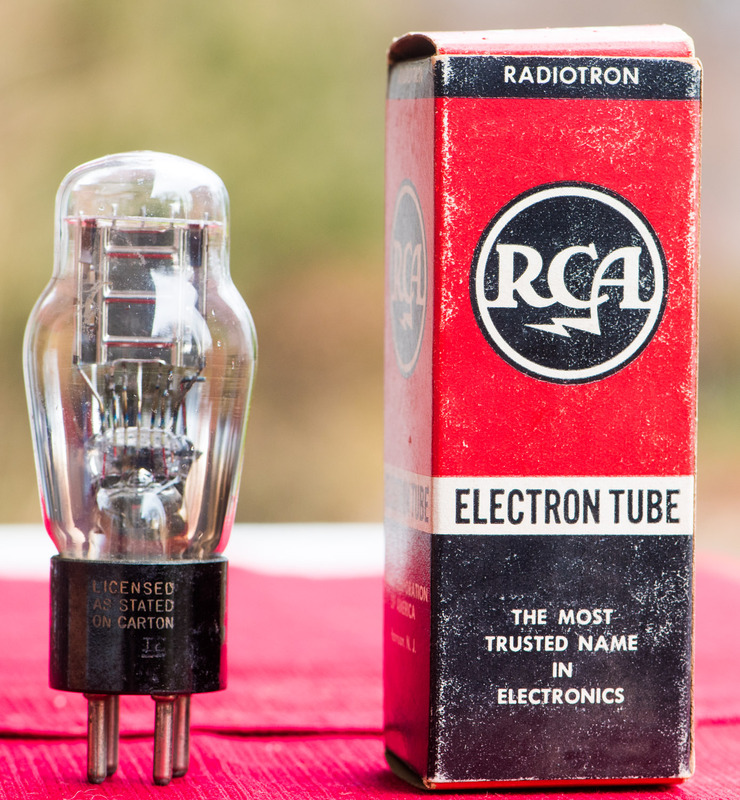 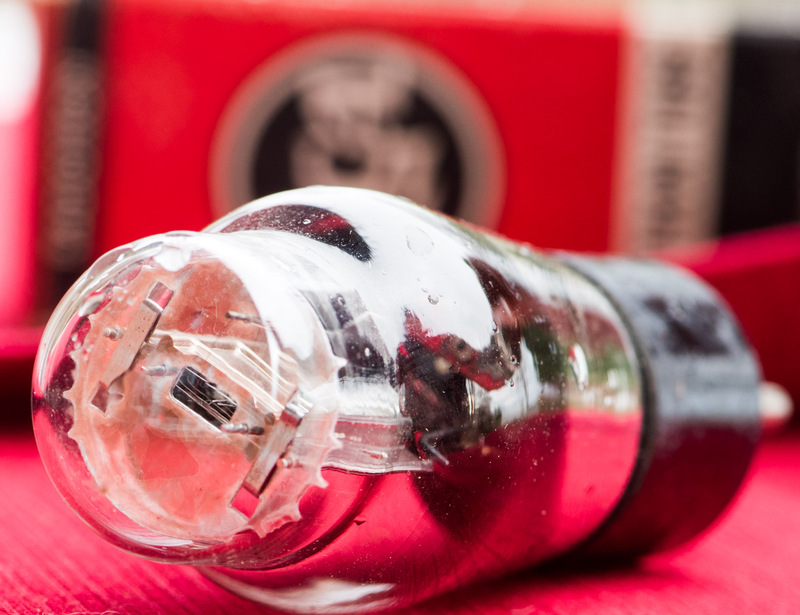 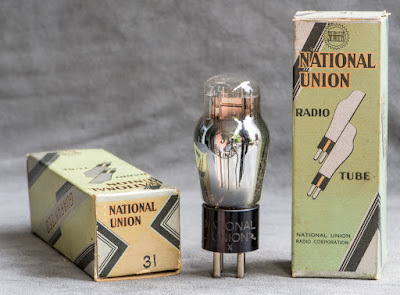 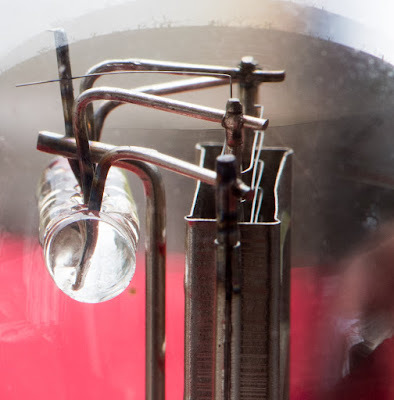 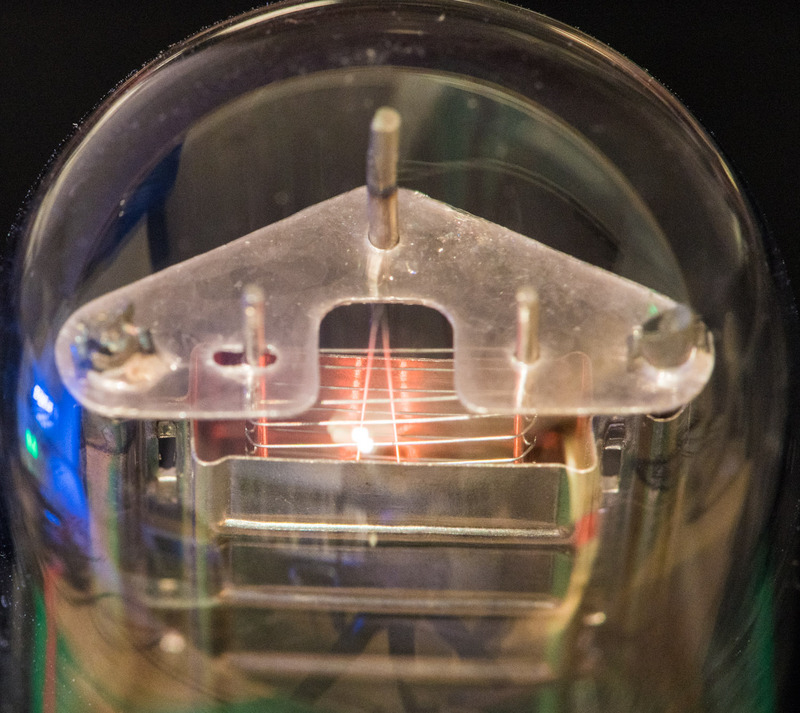 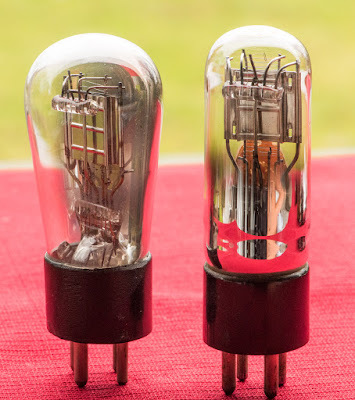 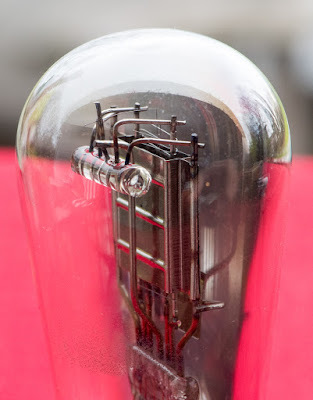 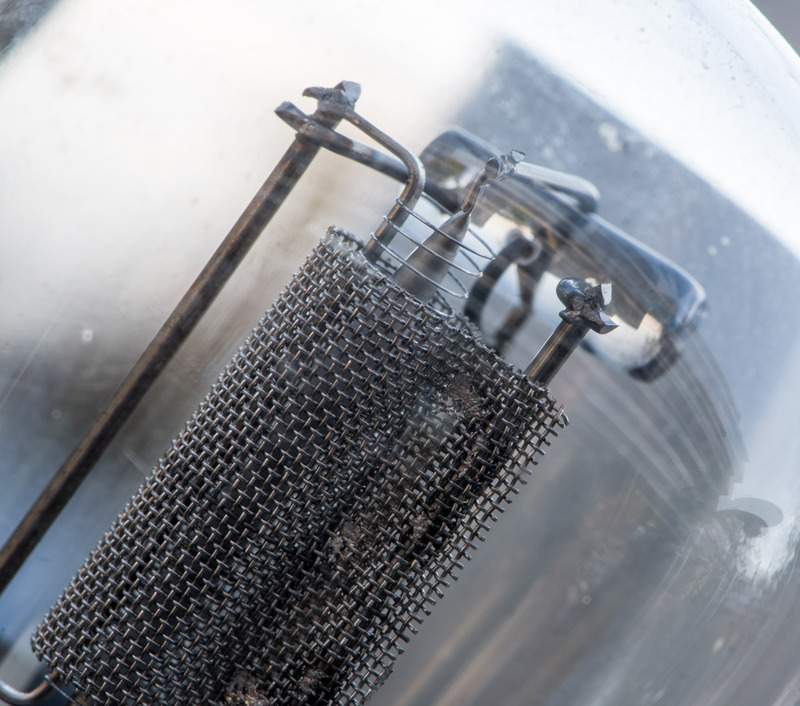 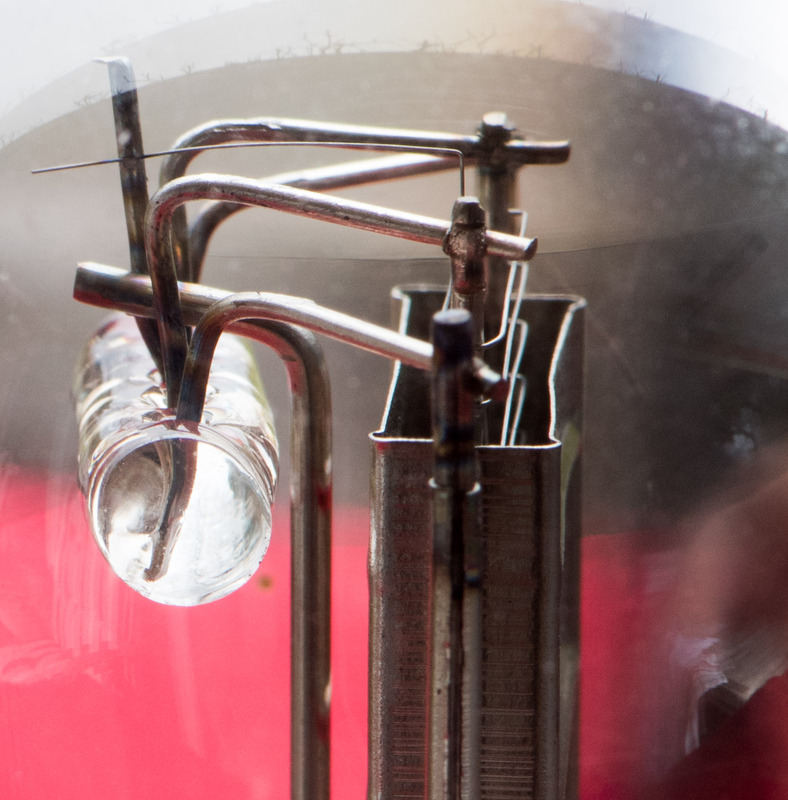 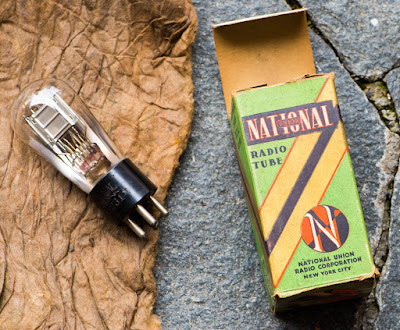 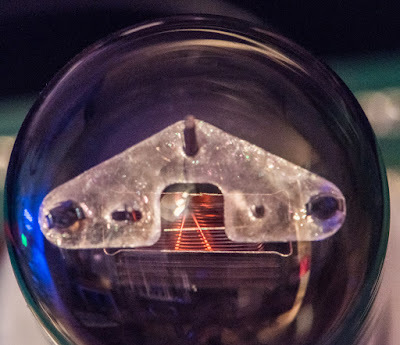 The early tubes, named UX231 came in the usual globe shape but also in a tubular bulb. 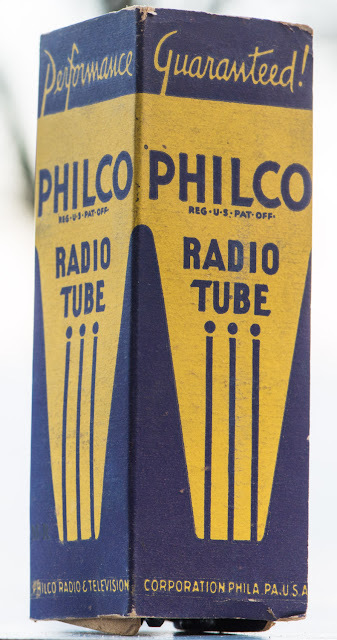 Later the tubes moved to the more modern coke bottle. Here we also have the different variants of support structures on the top. As expected from the low filament power, the glow is quite dull. 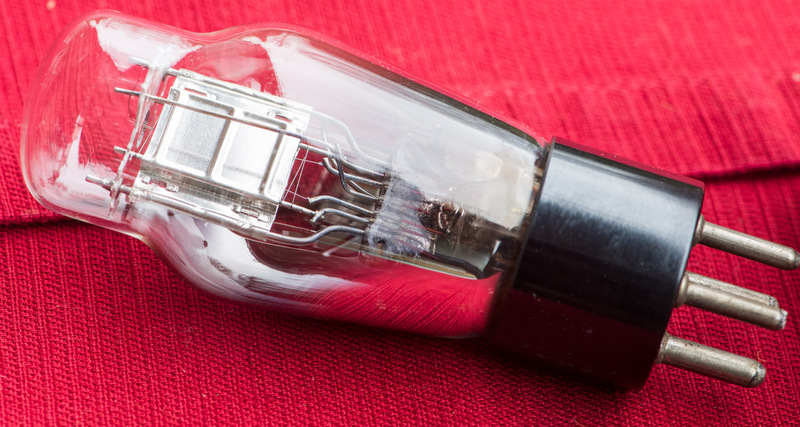 They are also called dull emitter tubes for this reason. 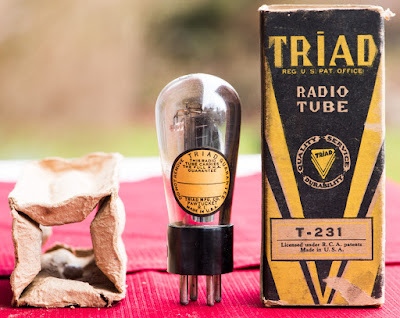 I hope you enjoyed the first tube of the month in 2016. Stay tuned for many more interesting tubes to be presented.